A reader emailed me requesting a recipe for honeydew cupcakes. I took a shot at it and sent her what I “would” do. I haven’t heard back if she tried it or how it worked out, but I did them myself with some minor adjustments. I decided to do both cantaloupe and honeydew. I thought the color combination would look nice. I knew when I was first asked about honeydew cupcakes that this recipe would be a challenge. Melon flavors are pretty mild and not what you think of when you think of baked goods. I knew straight off that I would need a fruit filling as the cupcake alone wouldn’t be melony enough. The fruit fillings worked great, especially the cantaloupe. The cupcakes were very moist and dense. I expected that with the all the chopped fruit and the fruit puree and that was a price I was willing to pay to get the flavor I was aiming for. I felt using a standard butter-based recipe would have been too over powering. The frosting was sweet so I only used a little of it, smoothing it on as opposed to piping it on. Considering what I was up against, I consider the cupcakes a success. I am especially satisfied with the cantaloupe cupcakes. I could really taste the cantaloupe and the overall experience was nice. This was also Naomi’s first baking lesson. She was being fussy so I held her in one arm while I cracked eggs and mixed cupcakes with the other. She is doing great though — getting really big, smiling, sleeping better (most nights). It truly is amazing how quickly they change. Lastly, I posted a table of contents to help you find recipes from the archives and enabled two new features that can be found at the bottom of each post – print this post and email this post. I also plan to do a thorough index. It will take a while, but it would be cool and helpful – no doubt. 1. Whisk together flour, baking soda, and salt in a large sized bowl. Add sugar and mix to combine. 2. In a separate small bowl, beat eggs to break up. 3. Add the oil and vanilla to the eggs and mix to combine. 4. Add the wet to the dry ingredients, mix to combine. 5. Separate the batter into two, about equal sized batches. 6. Add the honeydew to one batch and the cantaloupe to the other. Mix to combine. 7. Scoop into cupcake papers with an ice cream scooper about 3/4 full. 8. Bake at 350 degree oven for ~30 minutes or until a cake tester comes out clean. Note: These cupcakes are moist. Be sure that they are fully baked before removing them from the oven. The cake tester (or toothpick) must come out clean. 1. Add the cantaloupe and water to a pot. Cook for 5 minutes over medium-high heat. 2. Stir together sugar and cornstarch then stir into the cantaloupe. 3. Cook until thick, about 5-7 minutes. 1. Add the honeydew and water to a pot. Cook for 5 minutes over medium-high heat. 2. Stir together sugar and cornstarch then stir into the honeydew. 3. Add 1 cup of powdered sugar, vanilla, and cardamom and beat at low speed, scraping the sides and bottom of the bowl, until light and fluffy. Add more powdered sugar to arrive at the consistency and sweetness you like. 1. Fill each cupcake with filling. 3. Chop some chiffonade of fresh mint and top cupcakes with a bit. Gorgeous! I love your use of seasonal fruit. I just picked up a cantaloupe at the Farmers Market today! These look very cute. 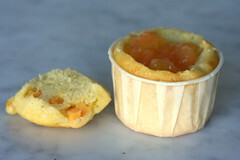 I’ve been toying with the idea of making melon cupcakes, and I think I have to, now that I’ve seen yours… But I need to make some nectarine cupcakes first, because we have plenty of ripe nectarines that will go bad if I don’t use them soon. Digging the buttercream recipe, but never been a super fan of cantaloupe or honeydew. Too sweet. By the by, why did one melon turn the other melon down for marriage? Beacause they cantaloupe. Get it?! those sound like they’d taste so fresh and fruity. they’re very beautiful! nice job!! I love all your cupcakes! Long time reader… I just saw you in Adorn too! Congrats!! I tried your recipe and in terms of taste, it’s wonderful. I made it without the frosting and the sweetness was just right. But, for some reason my cupcakes tilted to one side when they rose… Why did this happen? Speaking of nectarine cupcakes, I’ve been dying to make a blood orange coffee cake after making a beautiful clementine bundt cake a couple of months ago…would be a great way to bid adieu to the summer! I thought of using melons in muffins before, but dismissed it straight away as I thought it wouldn’t work. Your recipe has become an inspiration! the cupcakes look great. though i’m not a big melon fan in terms of taste, do you think peaches could be substituted? in terms of moisture content. ps. the little one is adorable. she will be under your feet while you are cooking in no time. That’s amazing. I’d always wondered why no one had ever tried melon in cake. I’ve made successful papaya bread, but that’s the closest I’ve tried; these are beautiful and intriguing. I love your website, and your cupcakes are truely inspired. I was thinking about this recipe, and thought that white chocolate might be over powering to the melon cupcake. Perhaps, I thought, a honey and cardamom buttercream? Maybe even a honey cardamom swiss merenge buttercream? I just thought I’d toss that out there and see what you thought. Sheesh, talk about a challenge! It sounds like you did a great job with the melon. 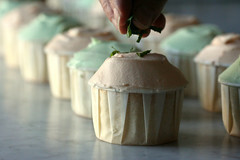 What I really like is the cardamom frosting, and mint with melon is so, so nice. I love going through your archive just to be inspired by the flavor combinations. evince, there is nothing special about the recipe to cause that. perhaps the oven isn’t level or there are hot/cool spots in the oven? Hailey, I wouldn’t say the frosting overpowered the cupcake, because I kept the amount of frosting on the light side. I really enjoyed the flavor of the frosting even though its a bit sweet, but by all means, folks should try other frostings that they might prefer. I made these cupcakes this weekend and they rock. I found that when I made the honeydew cakes with a really over-ripe honeydew the taste was marvelous (however, the filling turned out to be runny). I love them! 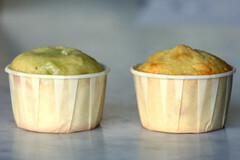 I tried the honeydew cupcakes, but altered the recipe a little, and found they tasted like cornbread, but I didn`t have to worry about them being dry. The white chocolate cardamom buttercream was amazing. I will definately be using that recipe over again! I am going to try these, but I don’t understand about the filling…..